The United States is becoming increasingly challenged at sea. Last year the Admiral Philip Davidson, current commander of Indo-Pacific Command, told The New York Times that “In short, China is now capable of controlling the South China Sea in all scenarios short of war with the United States.”1 This increasing anxiety is echoed in the 2016 Surface Forces Strategy (SFS), which identifies a “new era” of threats and challenges.2 In response the United States Navy has been at work on new concepts to help bolster combat power like Distributed Lethality and Distributed Maritime Operations. While neither have been released to the public in full, unclassified versions, the gist of both are clear. The SFS ascribes three tenets to distributed lethality – increasing the offensive and defensive capability of all platforms, distributing platforms, and improving the survivability and complimentary nature of their systems. The Navy is on the right track but can achieve a much larger increase in distribution and offensive capability by looking beyond the surface assets it already owns. The Navy has argued that it requires a 355-ship fleet to perform all of its missions, but the current shipbuilding program will not meet that goal anytime in the next three decades.3 Recently the Under Secretary of the Navy lamented the state of the under-resourced fleet “no decrease in operational requirements, and yet there are not enough ships to do the mission.”4 The Navy needs to look for combat power elsewhere if it cannot soon build or buy the ships it needs. In a fight for sea control, the Marine Expeditionary Units (MEUs) are currently a wasted asset. MEUs are powerful, mixed purpose units built around a Marine infantry battalion with significant additional ground capability in tanks, armored vehicles, and artillery with a full range of air combat and lift capability. But Marine doctrine and training emphasize only operations ashore, and operations in getting to shore. The Corps has traditionally failed to consider their role in maritime operations like sea control or sea denial and husbanded its resources for the terrestrial fight. This is changing slowly – the unreleased Expeditionary Advanced Base Operations (EABO) concept is expected to emphasize the Marine role in a maritime campaign, but EABO is a Marine-led concept. 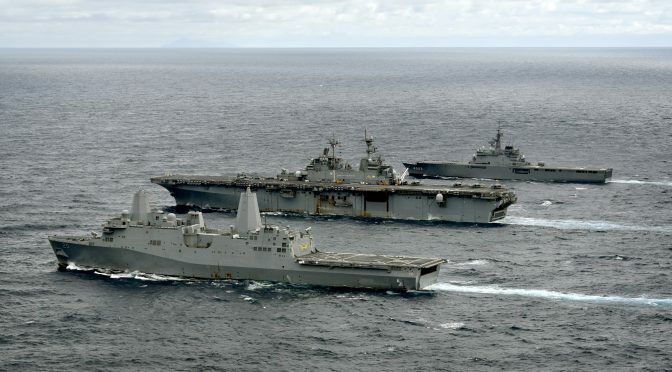 The Navy needs to push Marines back into a role where they support naval operations and stop allowing the Marines to build a capability focused only on power projection ashore. Marines already have some capabilities that can contribute to a sea control fight. They had the first operational F-35 squadron, ahead of the Air Force and the Navy and they have experience training and operating their jets in rugged and austere environments. Marine rocket artillery (HIMARS) recently fired at their first floating targets and have also demonstrated a rapid infiltration and raid capability with the same platform.5,6 They are going further and investing in a new Group 5 Unmanned Aerial System (UAS) program called the MAGTF UAS Expeditionary (MUX) that would contribute to targeting, reconnaissance and strike architecture.7 The Marines need to focus their training and planning around employing these assets in support of maritime operations not operations ashore. Furthermore, the Marines need to rapidly diversify their portfolio of weapons when it comes to sea control and denial. They need to move ahead with a longer range, anti-ship missile on a mobile platform – much like systems Poland has acquired for coastal defense that fire the Naval Strike Missile.8 Such a weapon would drastically increase the range and lethality with that the Corps could project over the water. Employed, on or near narrows, straits and other chokepoints, these missiles could deny an adversary passage or annihilate an amphibious force. The Army has been interested in the NSM and has made Long Range Precision Fires their top modernization priority.9,10 Continued integration with the Navy and Marines should lead to a joint littoral fires capability that provides the fleet more options for distributing their surface fires. Marines can also increase their contribution by investing in a coastal or fast attack craft capability. Currently the Navy maintains a portfolio of brown water capability in Naval Expeditionary Combat Command (NECC) but it is primarily for supporting special operations and harbor defense. A new Marine force, employing Mk VI patrol boats armed with NSMs would be a potent threat to even the largest and best protected enemy vessels at a fraction of the cost of adding more destroyers and frigates the surface fleet. Another opportunity for increasing the Navy’s lethality and combat power is the Air Force. The Air Force recently acquired the Long Range Anti-Ship missile, a new, stealthy naval cruise missile that can be launched from B-1 bombers. This is a key capability that allows the Air Force to better support the Navy – a single B-1 bomber can carry 24 LRASMs, so a flight of four bombers can launch more anti-ship missiles that an Arleigh-Burke class destroyer and then return to do it again in hours.14 The Navy and the Air Force should continue to expand the number of aircraft capable of delivering LRSAMs and train for their employment jointly. Air-delivered, long range anti-ship missiles are a new capability for the U.S. military but one long employed by Russia and China. Sea control is a joint mission. No longer can the Navy alone get it done. 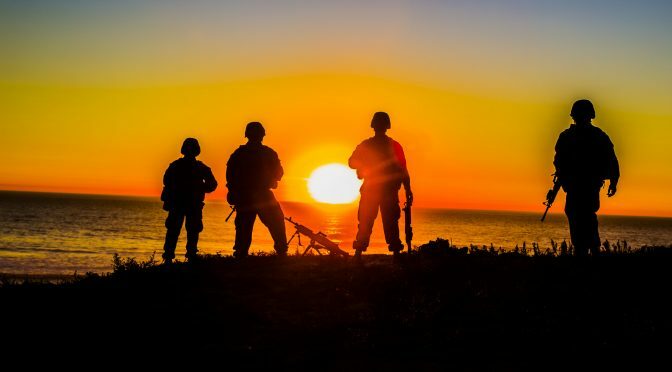 America’s control of the sea is fundamental to our peace and security and it will require forces, capabilities, and support from the Marines, Army, and Air Force. 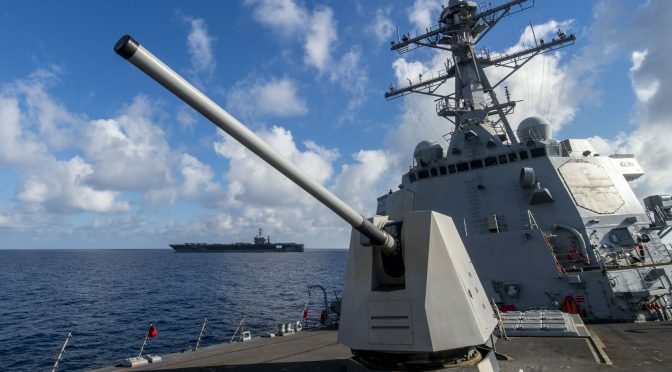 In pursuit of new concepts like Distributed Lethality and Distributed Maritime Operations, the Navy needs to look beyond the fleet for ways to increase combat power. The 2016 SFS labels the “right mix of resources to persist in a fight” as one of the three tenets of Distributed Lethality.15 At a minimum that mix must include Marine and Army surface fires, fast attack craft, Air Force anti-surface warfare, and whatever else is needed to distribute firepower and sustain command of the seas. Hannah Beech, “China’s Sea Control is a Done Deal ‘Short of War With the US’” New York Times (20 September, 2018) https://www.nytimes.com/2018/09/20/world/asia/south-china-sea-navy.html. United States Navy, Surface Forces Strategy (2016) https://www.public.navy.mil/surfor/Documents/Surface_Forces_Strategy.pdf. Goeff Ziezulewicz, “Budget watchdog questions Navy’s plan for 355-ship fleet” (24 October 2018) https://www.navytimes.com/news/your-navy/2018/10/24/budget-watchdog-questions-navys-plan-for-355-ship-fleet/. 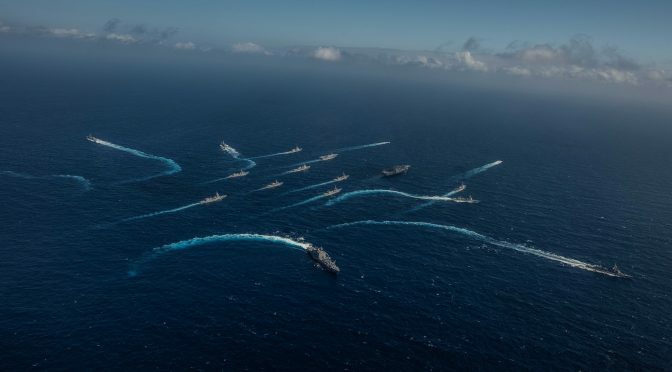 Gidget Fuentes, “Modly: Navy Needs to Radically Change How it Operates in New Era of Great Power Competition” USNI News (14 February 2019) https://news.usni.org/2019/02/14/modly-navy-needs-radically-change-operates-new-era-great-power-competition. Gidget Fuentes, “Marines Fire HIMARS From Ship in Sea Control Experiment with Navy” USNI News (24 October, 2017) https://news.usni.org/2017/10/24/marines-fire-himars-ship-sea-control-experiment-navy. Shawn Snow, “ The Corps’ HIMARS are going airborne as Marines bring them to targets via KC-130s” Marine Corps Times (28 December 2018) https://www.marinecorpstimes.com/news/your-marine-corps/2018/12/28/the-corps-himars-are-going-airborne-as-marines-bring-them-to-targets-via-kc-130s/. Meghan Eckstein, “Marines Zero In On Requirement for Unmanned Aerial Vehicle” USNI News (23 April 2018) https://news.usni.org/2018/04/23/marines-zero-requirements-future-mux-unmanned-aerial-vehicle. Jaroslaw Adamowski, “Poland Eyes Third Missile Squadron, Subs for Navy” Defense News (4 November 2016) https://www.defensenews.com/naval/2016/11/04/poland-eyes-third-missiles-squadron-subs-for-navy/. Joseph Trevithick, “The Army Eyes Getting Into the Ship Killing Business With This Cruise Missile” The Drive (12 February 2018) http://thedrive.com/the-war-zone/18427/the-army-eyes-getting-into-the-ship-killing-business-with-this-cruise-missile. David Vergun, “Long-range, precision fires modernization a joint effort, Army tech leader says” Army News Service (22 August 2018) https://www.army.mil/article/210198/long_range_precision_fires_modernization_a_joint_effort_army_tech_leader_says. Shawn Snow, “Marines consider forward-firing rockets for MV-22 Osprey” Marine Corps Times (21 March 2018) https://www.marinecorpstimes.com/news/your-marine-corps/2018/03/21/marines-consider-forward-firing-rockets-for-the-mv-22-osprey-fleet/. Chris O’Connor, “Distributed Leathernecks” CIMSEC (23 February, 2019) http://cimsec.org/distributed-leathernecks/22448. Douglas King and Brett Friedman, “Why the Navy Needs a Fighting Connector: Distributed Maritime Operations and the Modern Littoral Environment” War on the Rocks (10 November, 2017) https://warontherocks.com/2017/11/navy-needs-fighting-connector-distributed-maritime-operations-modern-littoral-environment/. Oriana Pawlyk, “B-1 Crews Prep for Anti-Surface Warfare in Latest LRSAM Tests” Military.com (3 January 2018) https://www.military.com/dodbuzz/2018/01/03/b-1-crews-prep-anti-surface-warfare-latest-lrasm-tests.html. This week CIMSEC will be featuring articles on the U.S. Navy’s nascent Distributed Maritime Operations (DMO) concept. Below are the articles and authors that will be featured during the topic week and could be updated as prospective authors finalize additional submissions.